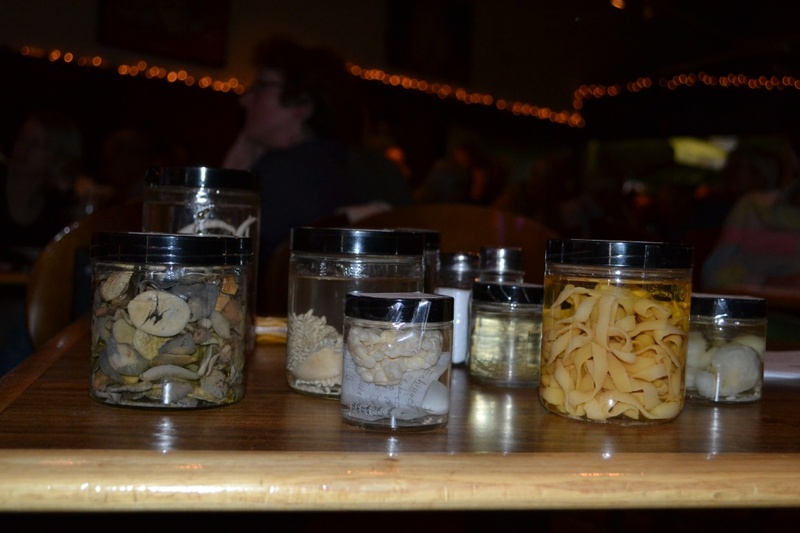 On the evening of May 28th, almost 100 members of the public and a smattering of UofC students crammed into the back room of the Ironwood Grill, Inglewood, to hear about parasites. 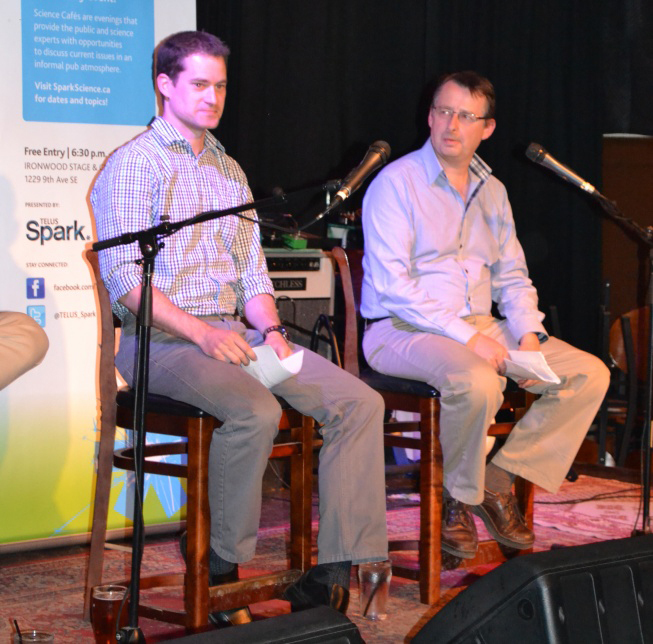 Dr Patrick Hanington, of the University of Alberta’s School of Public Health and UCVM’s Dr John Gilleard, were the guest speakers at a Science Cafe, co-hosted by the TELUS Spark Science Cafe and the UofC’s NSERC CREATE program in Host-Parasite Interactions. Dr Gilleard started proceedings by providing the audience with an overview of the impact of parasitic diseases, specifically those caused by parasitic worms, i.e. helminths. Usually thought of as diseases of the poor in sub-Saharan Africa and South-East Asia, many in the audience were surprised to learn of the negative impact caused by helminths in the livestock industry in the developed world. The cost in Alberta runs into the tens of millions of dollars. Many of the anti-parasitic drugs currently used were first developed for the livestock industry and later licensed for use in humans; a great example of comparative medicine in action. Unfortunately, resistance to these drugs is now commonplace in parasites of livestock and an emerging concern for humans. Not to paint a completely bleak picture, Dr Gilleard highlighted how new approaches in molecular biology and genomics are helping find new treatments. Dr Hanington focused on a helminth disease called schistosomaisis, which is caused by the Schistosoma worms. These worms spend part of their life-cycle in snails, from where they emerge in aquatic habitats to seek a mammalian host, including humans. Drawing on his own research, Dr Hanington described how this complex life-cycle makes it difficult to eradicate the parasites through drug treatment. As effective are simple changes in human behaviour. For example, lakeside workers wearing knee-length rubber boots and the need for decent sanitation. During the break, the public gathered around a table upon which sat specimen jars containing various helminth species, ranging from microscopic to meter-long. The over-riding emotions were one of mild horror and intense fascination. A question period followed, where the audience asked about a broad range of topics, including: the potential effects of climate change to the likelihood of helminth infection in Alberta, and how research into these parasites could be better funded. The event was a huge success and hopefully just the first collaboration of many between the Host-Parasite Interaction program and the city’s cultural institutions. During the morning of Tuesday, May 28th, Dr. John Gilleard was interviewed by Dave Norris, radio host of “My Two Cents Flat” from CJSW 90.9FM. Click here to hear the interview. More Photos of the Science Cafe and Dr. Hanington’s Seminar in the afternoon of May 28th at the UofC and the trainee pizza lunch.